Average Height	: 9" - 12"
Average Weight	: 10 - 16 lbs. Photo Courtesy of : BratPack Rescue, Inc.
Tidewater Bichon Frise Rescue, Inc. The Bichon Frise dates back as far as the 13th century. The breed is a descendent of the Barbet Water Spaniel and the Poodle. The Barbichon family of dogs includes the Bichon Frise, the Bolgnese, the Coton de Tulear, the Havanese, and the Maltese. All originated in the Mediterranean and have a similar look and disposition. The earliest records of the Bichon Frise breed date from the 13th century, when French sailors brought the dogs home from Tenerife, one of the Canary Islands. It's thought that Bichon Frise dogs had been taken there by traders who used the Phoenician trade route, and that the Bichon Frise originally developed in Italy. Still other historians believe that Spanish seamen brought the breed to Tenerife and, in the 14th century, Italian (rather than French) sailors brought them back to the continent. 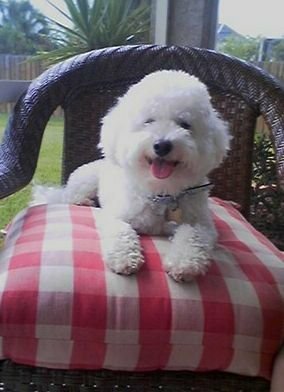 According to this version of the story, when the French invaded Italy in the 1500s, they brought many Bichon Frise dogs back to France as war booty. Records show that in the 13th century, French sailors brought the dogs home from Tenerife, one of the Canary Islands. It's thought that Bichon Frise dogs had been taken there by traders who used the Phoenician trade route, and that the Bichon Frise originally developed in Italy. Regardless of how the Bichon Frise arrived in Europe, the breed quickly became a great favorite with nobility. Bichons were popular in royal courts during the reigns of France's King Francis I and England's King Henry III in the 16th century. King Henry III was so fond of his Bichons that he carried them wherever he went in a special basket that he hung from his neck. Bichons became favorites of Spanish royal families and even of such painters as Goya, who included a Bichon in several of his paintings. In the 19th century it was a popular organ grinder's dog and also a circus performer. Interest in the Bichon Frise remained strong during the rule of Napoleon III, but then the little dog fell out of favor with royalty until the late 1800s. By that time, it was considered a common dog, sometimes owned by organ grinders or circus performers and sometimes trained to help lead the blind. Had it not been for the Bichon's intelligence and appeal, the breed probably would have become extinct during this period. After World War I, however, French breeders became interested in the Bichon and worked to preserve the breed. The official breed standard was adopted by the Société Centrale Canine of France on March 5, 1933, at which point the little dog had two names: Tenerife and Bichon. Later that same year, when the Bichon Frise was recognized by the Fédération Cynologique Internationale (an international kennel club), the FCI president, Madame Nizet de Leemans, renamed the breed the Bichon à poil frisé ("Bichon with the curly coat"), and the moniker was anglicized to Bichon Frise. On October 18, 1934, the first Bichon Frise was admitted to the studbook of the French Kennel Club. Bichons Frises first arrived in the United States in 1956. •	Hypo-Allergenic ~ very low shedders. •	Great dispositions, affectionate and hardy. •	Great family dog, love to play, gentle and good with children. •	Prone to separation anxiety if left alone for long periods. •	Their small size make them a good apartment dog. •	Active, so enjoy lots of exercise. •	Very intelligent, love to learn tricks. •	Can be prone to skin problems and allergies.